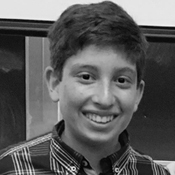 Darian Ahmadizadeh is a 13-year-old mathematician residing in New York City. As a math lover, he wants to spread his passion for math to other students. He has received numerous awards, one being a perfect scorer on the American Mathematics Competition 8 in 2016. He also featured in the Riverdale Press in September of this year. Mathematics is beautiful, it is all around us. It even has tons of applications in the real world. However, these applications are not being taught in the classroom. The mathematical educational system makes teachers teach the subject, rather than the reasoning. The solution for the dislike for math of students and adults is the curriculum needs to have teachers teach the amazing contributions mathematics has in the real world as an addition to the subject.